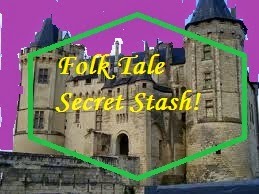 Fairy Tale Fandom: Folk Tale Secret Stash: "The Frog Who Became an Emperor." Folk Tale Secret Stash: "The Frog Who Became an Emperor." Well, Chinese New Year, actually. That’s right, today is the start of the Lunar New Year. 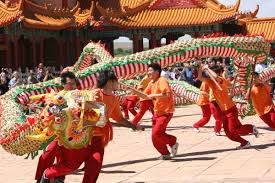 In many Asian countries, each New Year is marked with an animal to represent it. Using these animal symbols and other factors, supposedly people can determine how the year will progress. There’s even an old tale that explains how these animals all came together. Today marks the end of the year of the horse and the beginning of the year of the sheep. Or is it the year of the goat? It seems that because of the intricacies of languages and translation, there’s some discrepancy as to what kind of animal represents this year. The other animals in the famous “Chinese zodiac” include tigers, dragons, oxen, rats, snakes, rabbits, pigs, monkeys, roosters and dogs. Sadly, I think there’s an animal that’s sadly been overlooked in terms of getting immortalized as a zodiac animal. Alas, there is no year of the frog! Why a frog? Well, why not a frog!? After all, a frog once became an emperor in China? This is an old story of the Zhuang people of China. It’s a favorite Chinese folk tale of mine. It’s also been adapted into comic form in the Jim Henson’s The Storyteller graphic novel from Archaia Studios (a nice book. I recommend it). Now, once there was a very poor couple who were expecting a child. It got so bad that the husband had to go very far away to find work. Before he left, he told his wife that whether the child was a little boy or a little girl, to raise it well. The baby eventually came and boy was the mother surprised to find that it wasn’t a boy or a girl. It was a frog! Now, you and I as fairy tale geeks may not see this as quite so troubling from the outside, having encountered all sorts of “Tom Thumbs” and “Hans my Hedgehogs” as well as other strange birth stories but this woman had the misfortune of not knowing that she was smack in the middle of a fairy tale. Anyway, the woman eventually decided to heed her husband’s words and raise the child as best she could. As time went by, the frog child started to grow. He grew much bigger than a regular frog, to about the size of a human being. He also started to show a strange knowledge of things. He claimed to “know everything under heaven”. He predicted when his father would return home. He also predicted that their country was in trouble and asked him to bring him to the capital city to help. His father agreed, reluctantly. 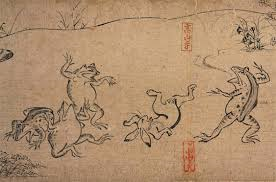 In the capital city, the frog and his father found a posted decree from the emperor saying that he would give his daughter’s hand to whoever could turn back the invaders at their gates. The frog snatched the decree off the wall and ate it (no kidding. That’s what the story says). The guard standing near the decree had little choice but to bring the frog to see the emperor. The frog told the emperor that he needed no men, weapons or horses to turn these invaders away. All he needed was a giant heap of glowing embers. Naturally, the emperor thought this request (and possibly the whole situation) was quite odd, but agreed. The embers were brought and the frog started eating them. For three days, the frog stuffed his face full of embers. Then, when he was done, he told the emperor to have his archers stand down and open the gates to the invaders. The invading army streamed in and the frog, from his place at the top of the gate tower started spitting fire down on them. Naturally, the enemy fled in disarray. At this point, all seems well for the frog. He saved an empire and is betrothed to a princess. Well . . . about that last part. It seems the emperor didn’t really like the idea of his daughter marrying an amphibian. So, he told the frog that she had disapproved of the match (she did no such thing). Instead, the emperor decided that the princess would choose her suitor through the casting of the embroidered ball. Men gathered from all over China to have a chance at catching the ball. The first time she threw it, the frog caught it. He just sucked it up into his mouth. 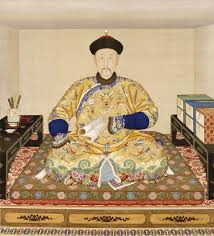 The emperor then just makes up a rule saying that the ball has to be caught by a human hand (The emperor’s a fink!). Anyway, the ball is cast again and this time it’s caught by a handsome young man. Now, the match is set. Who is this young man? How did the frog become an emperor? What happens to emperors who break their promises? You can find out the rest by clicking on this link right HERE. Or, if you feel so inclined, you can see and hear me telling the story to my webcam by clicking HERE (I warn you, I’m not the greatest on camera). Anyway, this is a favorite of mine to read and tell. I continue to think that East Asia is a great untapped resource for fairy tales for those of us here in the Western part of the world. This one also reminds us of how universal some of these motifs are. In this case, the Animal Bridegroom motif. In the comments, let me know if you think there should have been a year of the frog. Also, clue me in to what your favorite Chinese folk tale is. And may the new year bring you lots of joy and prosperity! Favorite Chinese folktale/fairy tale.. I didn't realize until you asked that almost all my favorite Asian fairy tales are actually Japanese! Hardly any Chinese. Honestly I'm not sure why. I have a children's book of Chinese fairy tales and two volumes of collected Chinese tales as well as a smattering of them in my multicultural volumes (the multicultural volumes are my favorite collections). And I'm quite fascinated by the customs and superstitions but I realized none of those things are "full blown stories". There's one that sticks in my brain, for some reason, maybe because it's very funny (to me anyway). I don't even know which book it's in, sorry! I don't know what it's called but it's similar to that "cook little pot, cook" story, in which a poor family are given a pot. From memory they have no idea how to use it though until one day a brush falls into it and suddenly the pot produces brush after brush after brush. The family realize the opportunity and start a brush selling business (they don't realize how the pot works it seems). Then, one day, in the middle of all the bustle that happens around a thriving business, a gold coin falls into the pot. Lo and behold the pot starts producing gold coins! (Score!) The family expand what they're doing and both care for and give jobs to everyone in the family so they can keep up. The grandfather, however, is so old and weak that he's given the easiest job they can find for him: to scoop the coins out of the pot. But even this is too much for him and one day he falls over - dead. Into. The. Pot. So... the pot start producing dead grandfathers and the family have to use all their money to bury all the dead grandfathers and are left just as poor as they ever were. The end. I'm sure I've gotten a few things wrong but this is how I remember it! If you'd like recommendations, some of my favorites include "Li Chi Slays the Serpent" and "The Magic Pear Tree". Also, may I suggest the book "Chinese Fairy Tales and Fantasies" translated and edited by Moss Roberts. I'm actually quite attached to my copy, but that's probably because it's the first folk tale book I bought when I was just getting into storytelling. Thank you - that's one of the ones I do have (actually I have two for some unknown reason, yet neither is the gorgeous Folio edition.. I still cannot part with either. I know. Weird.). We went to a Chinese New Year's festival yesterday (Sunday) and I made a point of seeing the storytellings and talking to the performer afterward. She said she's been doing Chinese storytelling for over 20 years and there just aren't many child-friendly collections out there and only a few adult volumes too. Most Chinese tales are found in other references - on Chinese cultures, superstitions, religious beliefs etc. They're sort of tucked in alongside other things, rather than collected separately. It's sort of odd, especially as Japanese tales are the opposite - many, many of those have been illustrated and there are quite a few collections, especially if you can read languages other than English. Thanks for helping keep these wonderful stories in circulation! Very awesome that you're doing storytelling and including these too. If you're ever wanting to incorporate puppetry these guy: (http://castleofcostamesa.com/puppet-stories/laibaos-quest-for-a-bride) have a wonderful set and are big on teaching CHinese tales, customs and language to kids too. I saw their Snow White & Rose Red puppets a while back and was completely enchanted. Felt dolls aren't usually my thing but the way they've thought about the story and presented them all is great. I can see how kids really respond to them. I realize just now that the book I recommended is probably one of the thinnest folk tale books I have, suggesting it has far less material in it than the others. Also "The Frog Who Became an Emperor" isn't even in that one. It's in The Peacock Maiden: Folk Tales from China, a book I received second-hand that seems to have no author and printed by Foreign Language Press out of Beijing. This isn't an uncommon issue. You see very few folk tale collections coming out of certain countries. Though, sometimes there are reasons for that. I remember wondering why I never saw many folk tales from Spain. When I finally found a book of Spanish folk tales, I realized that many of them actually had rather racist overtones. That could explain why. Not sure what the reason could be regarding Chinese tales. As for puppetry, I'm not sure that's for me. I mean, I like puppets, but the kind I grew up watching were the Jim Henson/Muppets variety where you didn't see the puppeteer and the puppets retained the illusion of being characters unto themselves. It would be hard to incorporate that with storytelling. PS We agree - a Year of the Frog seems like it would be an excellent thing! Very interesting blog. Got a few answers on different articles. Where is the Goat and the Wolf one. The Stuff of Legends: John Henry.